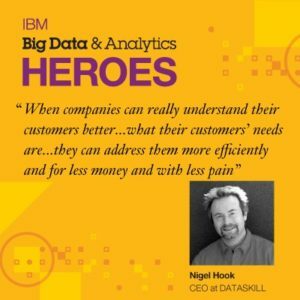 Nigel Hook, CEO at DATASKILL and this week’s IBM Big Data and Analytics Hero, declares that they “are looking to use the new cognitive computing to really differentiate their customer’s ability to drive revenue.” He discusses how companies can really understand their patients and ultimately their customers to impact revenues. What “gold nuggets” have you uncovered using big data and analytics? Today companies do analytics on 20 percent of their data; that is all the structured data that you have, but 80 percent of the data…about a patient is unstructured. The core capability that DataSkill has is to enable companies to look at all the data and use cognitive computing to really differentiate our customer’s ability to drive revenue. When companies can really understand…their customers’ needs…they can address them more efficiently, and for less money, with less pain, and that is completely relevant when the customer is a patient. So they can offer better treatments and better outcomes with a three dimensional view of a patient. How have big data and the cloud impacted how you do your job today? When we do a proof of concept (POC) we typically do it at a healthcare site because they like their data to stay there, due to HIPAA requirements. Coming in with a hardware box and provisioning the entire infrastructure around that for a POC is very intensive infrastructure-wise, but we want to focus on the solution and the benefits to the customer, so we work with them on their terms. That is what is exciting about Bluemix: to be able to provision those sorts of infrastructure assets very quickly and almost seamlessly to our developers that are focusing on the business value and driving that for the customer. It just means that we can spend more time on what is of value to the customer and less time on building the foundation of the infrastructure. How are big data and the cloud impacting our world? The biggest implementers and drivers of this technology in the cloud are actually outside of the US. Because of some of the legislation and policies around privacy, countries that are outside of the US (especially in the Asia-Pacific area) can actually leapfrog the capabilities we have to deliver in the US. While we do have early adopters for the cloud-based service in the US, we will really see it become more prevalent over the next 5-10 years.